Red Dead Online is opening up to more and more players throughout this week, and as cowpokes make their way to the urban center of this new multiplayer frontier, they're finding boats. Lots and lots of burnt out boats, precariously stacked throughout the claustrophobic-even-without-boats streets of Saint Denis. Either Rockstar's getting the mysterious world building started early for Red Dead Online or it's a glitch of some kind, but regardless, players are sharing their boat-out-of-water discoveries on social media to hilarious effect. It seems the boats can even injure or kill characters in certain circumstances; being physical objects you never know when one might shift unexpectedly, bringing your outlaw life to an untimely and unlikely end. 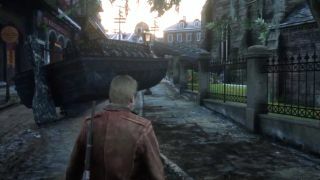 Rockstar Support recommends clearing the cache on your console to alleviate the boat issue, but I think it might be more practical to just stay inside and far away from windows if you ever hear a flame-charred keel scraping along the cobblestones. It's not clear what's causing these wrecked boats to appear in such great numbers, and especially in Saint Denis. However, it's far from the only glitch in the game. Another example has plagued GR+'s own Alex Avard with a cacophony of screams at the start of every Showdown Series. And hey, it is still just a beta - as long as the glitches stay in the "unnerving yet amusing" territory rather than erasing progress or anything like that, I'd say we're in pretty good shape. Aside from watching out for boats, read through our Red Dead Online guide to get a headstart on your fame, fortune, and fast horses.